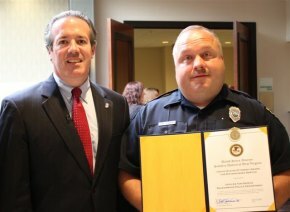 CHARLESTON, W.Va. – United States Attorney Booth Goodwin today presented the U.S. Attorney’s Award for Distinguished Service to Officer Tom Speece of the Ravenswood Police Department. Speece is a Prevention Resource Officer based at Ravenswood High School. Earlier this year, he learned a Ravenswood student had made a hit list of fellow students and intended to bring a shotgun to school to attack those on the list. Speece rapidly intervened, preventing the student from carrying out his plan. Goodwin presented the award after delivering remarks to the statewide Prevention Resource Officer conference at the Charleston Conference Center in South Charleston, W.Va. Goodwin commended 75 PROs for their efforts to prevent school-based violence, bullying, misuse of social media such as Facebook, prescription drug abuse and other problems that affect student well-being. Goodwin began meeting with schools throughout the Southern District to discuss school-based violence after a February school shooting in Chardon, OH, claimed the lives of three young people and wounded two others. Over the past several months, he has met with faculty and students concerning school-based violence prevention, Internet safety, bullying, and other issues facing schools. In April, Goodwin spoke to 129 school administrators during the West Virginia Center for Professional Development’s Principals’ Leadership Academy for new principals. Also in April, Goodwin named 40 high school juniors Ambassadors for Justice. The Ambassadors for Justice are students from high schools through southern West Virginia who have demonstrated strong character and a willingness to stand up to bullying and injustice in their schools. The weeklong Prevention Resource Officer conference and training in South Charleston was hosted by the West Virginia Division of Justice and Community Services. The Prevention Resource Officer program is a cooperative effort between schools and law enforcement. The program places certified West Virginia police officers who are also certified Prevention Resource Officers in middle and high schools across the state. The officers maintain an office in the school and are on duty a minimum of 35-40 hours per week. In addition to a regular school day, PRO's typically attend extracurricular activities throughout the school year. For more information on the Prevention Resource Officer program, please visit: http://www.djcs.wv.gov/pro/Pages/default.aspx.